This month, we will be hosting two great knit-a-longs! The Gaptastic Cowl knits up very quickly on size 13 needles ~it will quickly become on of your favorite accessories and would also make a terrific gift. This knit-a-long will meet on Wednesdays in November. 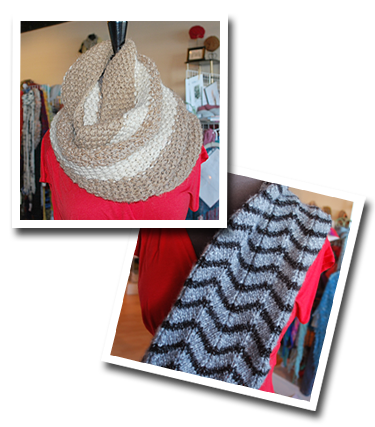 The Serenity Cowl by Tahki is beautiful chevron cowl knit in 2 colors of Zona yarn. Choose your own color combination to create YOUR unique project ~ what a great way to practice working with 2 yarns at once! The pattern costs $6 and can be purchased on ravelry.com or at the shop. This knit-a-long will meet on Tuesdays in November. Come by the shop soon to choose your yarn and to sign-up for the KALs ~ you will receive 20% off your knit-a-long supplies this month (not including sale yarn). There is no charge for the knit-a-longs with purchase of supplies from the shop. 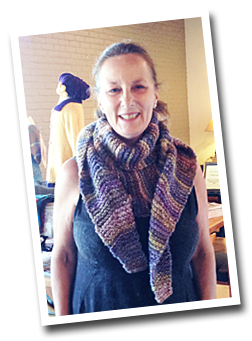 Congratulations, Debbie Garrot, our October knit-a-long drawing winner. Here she is wearing her beautiful shawl!